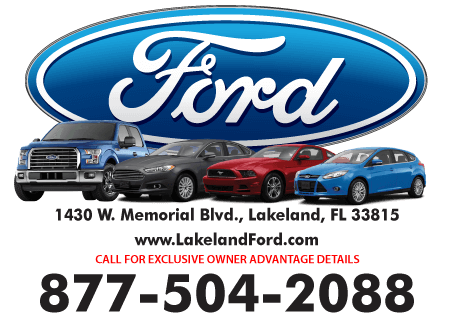 Come to Lakeland Ford and discover the Owner Advantage difference! Where extra value comes standard! Exceeding Customer Expectations Every Day! *Nationwide Lifetime Warranty valid on new vehicle purchases only. Not valid on Fleet or Commercial use vehicles. All Ford Plan Customers are not eligible for lifetime warranty or free maintenance. 1 year free factory maintenance valid on new and used vehicle purchases. Additional restrictions may apply. See dealer for complete details. **$1,000 Risk-Free Price Protection – Bring us a signed buyers order from an authorized dealer on an identical vehicle prior to purchase and if we cannot match or beat the price we will pay you $1,000. ***3 Day Exchange Policy: Request for exchange must be in written format and emailed to GBalasco@lakelandautomall.com within 72 hours of completion of paperwork. Dealer has sole discretion to exchange, replace, repair or cancel transaction.